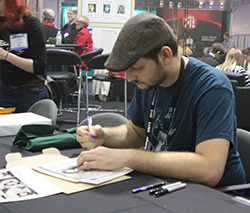 Last year, Steve Younkins came to USITT 2015 in Cincinnati to sign prints of his hugely popular theatre tech comic strip, Q2Q Comics. His event drew hundreds of fans and solidified his idea to make a book. This year, Steve is coming to USITT 2016 in Salt Lake City to sign the book, which he crowd-funded to the tune of $40,000 and had printed just in time for the show. 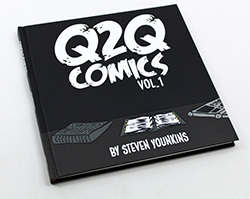 As he did last year, Steve also will sell original Q2Q strips at his Saturday, March 19, signing event. And on Thursday, March 17, he’ll be a featured speaker at USITT’s Young Designers & Technicians (YD&T) Awards. Younkins, resident sound designer for the Maryland Ensemble Theatre, said the past year has been an adventure. 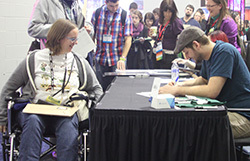 For USITT 2015, he enlisted a props artisan from Seattle who he met through an online theatre tech blog to help him sell comics and sign prints. Liz Hastings, a veteran of several USITT Conferences, became his girlfriend and studio assistant. At the show, Steve promised to unveil two new characters – a props master named Samantha and a scenic designer named Garvis. Garvis resembles Steve’s former roommate, he said. Samantha is partly based on Liz. He’s also excited that USITT Executive Director David Grindle asked him to speak on “risk-taking in design and tech” at the 2016 YD&T Awards. 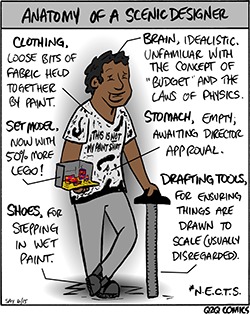 That’s right, he’ll be speaking as a sound designer … and a cartoonist. 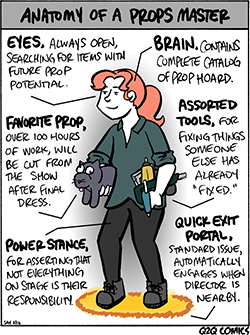 © United States Institute for Theatre Technology, Inc.